Once again, Truelytics is happy to announce a handful of new features and updates to our platform. Clicking on that will take you to our new account management page where you can easily update your name, firm name, email, phone, web address, and password. Expect more goodies and functionality to show up in this area in the near future. 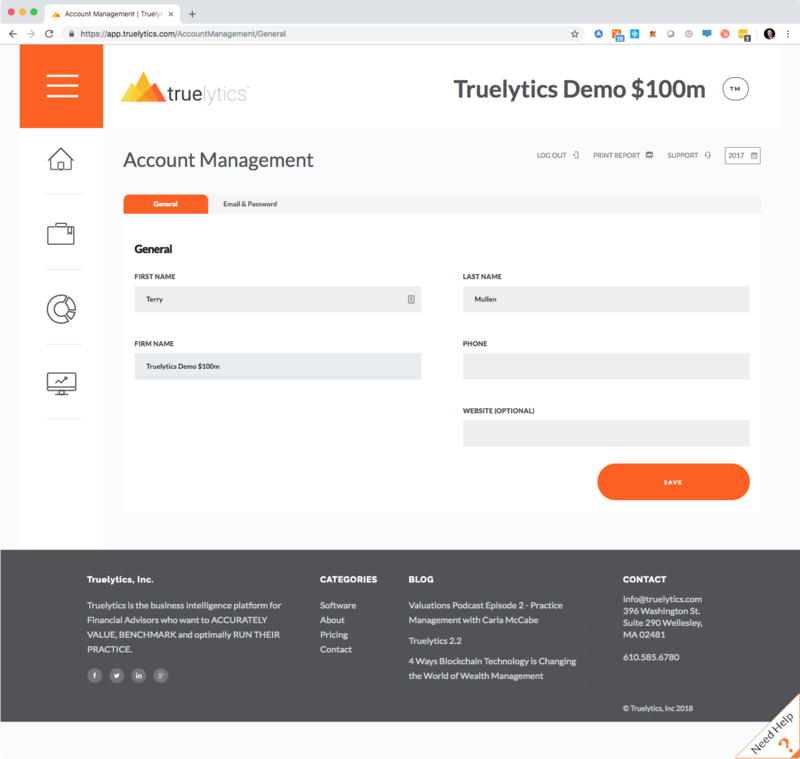 First-time users will now see a pop-up questionnaire that asks for their CRD, total assets under management, and why you are using Truelytics. In future releases, we intend to use this information in three ways. 1. Pre-populate areas of our survey to streamline the data entry process. 2. Quickly match your initial information against our extensive data set of Financial Advisory firms and provide high-level estimates of your valuation, Truelytics Score, and business, client, and market stability grades. We have streamlined the creation of 'future year or next year' eValuation reports by enhancing the amount of data that copies forward from a firm's earlier yearly eValuation. This minimizes the amount of effort required to generate a current, accurate valuation while updating key performance indicators and providing insights into year over year improvements. We have also associated a unique progress meter to each yearly eValuation report. This makes it easier, upon creating a new annual valuation, for users to identify how much more detail needs to be provided to validate and update their data and how soon they will have access to their updated report. We have also made it possible to assign firms to multiple enterprises. The first enterprise to provide a firm with a Truelytics license will be their primary relationship and any additional enterprises will be flagged as secondary relationships. This is our first step in a broader strategy to offer firms more control over with whom they share data. Stay tuned for our Truelytics 2.4 announcement coming this November.